Jane Eyre meets Prince Charming in two enchanting Regency love stories! Previously published as "Much Ado About Nuptials" and The Baron’s Governess Bride. Loyal Rebecca Beaton and gentle Grace Ellerby became lifelong friends while enduring the hardships of childhood at a harsh charity school. Now employed as governesses, they care for other people’s children, never expecting to know the blessings of loving marriages and families of their own. 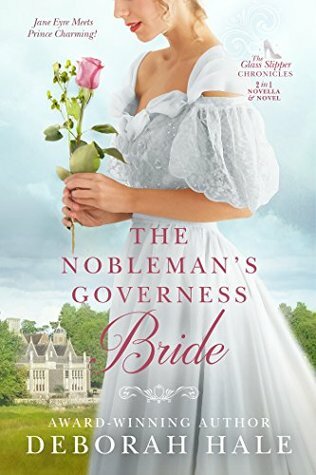 But when Rebecca and Grace encounter two special gentlemen who have suffered their own misfortunes, these humble governesses may become Cinderella brides! In “The Viscount Meets His Match” Sebastian Viscount Benedict knows from bitter experience that marrying a woman of lower rank and fortune brings nothing but heartache. He is determined to prevent his beloved brother from making the same mistake by wedding the local squire’s daughter. Rebecca Beaton disagrees. She is certain her former pupil, Hermione, truly loves the viscount’s brother and will make him a devoted wife. She tries to persuade formidable Lord Benedict to give the young couple his blessing. In spite of their many differences, Sebastian finds himself drawn to forthright, loyal Rebecca. Yet he fears his admiration for the lady could erode his good judgment and resolve. Rebecca fights her growing attraction to Sebastian, which threatens to divide her loyalties…and perhaps break her heart. If only she can help him believe in true love, there may be hope for more than one happy ending! In The Baron’s Governess Bride, Rupert Lord Steadwell is determined to hire the dowdiest, most unmarriageable woman he can find to care for his motherless daughters. The girls were heartbroken when their last governess eloped and Rupert does not want to risk a repetition. In her drab clothes, frumpy cap and spectacles, Grace Ellerby look like the ideal person for the job. Rupert has no idea that clever, caring Miss Ellerby is a beauty in disguise. Alarmed by unwanted advances from men in her previous positions, Grace is desperate to hide her dangerously attractive appearance and her growing feelings for her new employer. But when Lord Steadwell appears in danger of making a loveless marriage and saddling his daughters with a dreaded stepmother, Grace must risk everything to prevent it. Will a midnight kiss at a masked ball lead to scandal and ruin or will two wary hearts find their happily ever after at last? This is a sweet collection of two clean Regency romances. Make sure you start reading with that in mind, because if not, you'll end up like me, and become distracted by the progress of the story verses the percentage completed (#ebookproblems). I couldn’t figure how it could only be 25% finished when it appeared that things were wrapping up. This isn't a problem most people will probably have-I avoid reading book descriptions just before I start reading them so not too much is given away. Once I realized there would be two stories in the ebook, I was able to fully enjoy it. The first story, The Viscount Meets His Match, was fairly short (a novella), but had a good message about forgiveness. The second story, The Baron Meets His Match, was quite enjoyable. I wondered how long Grace was going to keep up with her disguise once she was hired, and it went on much longer than I expected. The strain alone caused by using her father's glasses would have made me want to give up the charade right off. Grace and Rupert were very likable characters, and their story was fun to read. While the main characters in the first book are included (briefly) in the second story, these stories would be fine to read on their own. I can see myself reading more of Deborah Hale's stories. Source: I received an eCopy from eBooks for Review in exchange for an honest review.